Review: Goosebumps: Download and Die! To me, the memorable thing about Goosebumps are the various monsters and mishaps that the kids encounter. With that in mind, this comic touched basis on that with about three references to the array of characters under the Goosebumps title which appears to be a decent amount for a first issue. However, I couldn’t help but wish for more. Goosebumps Download and Die! is a comic geared towards a younger audience and it shows. The dialogue is simple, characters get jealous easily, and a school crush is one of the biggest things to dwell upon. These aspects are not necessarily bad, but I could have used a little less of the school drama and a little more of the monsters. 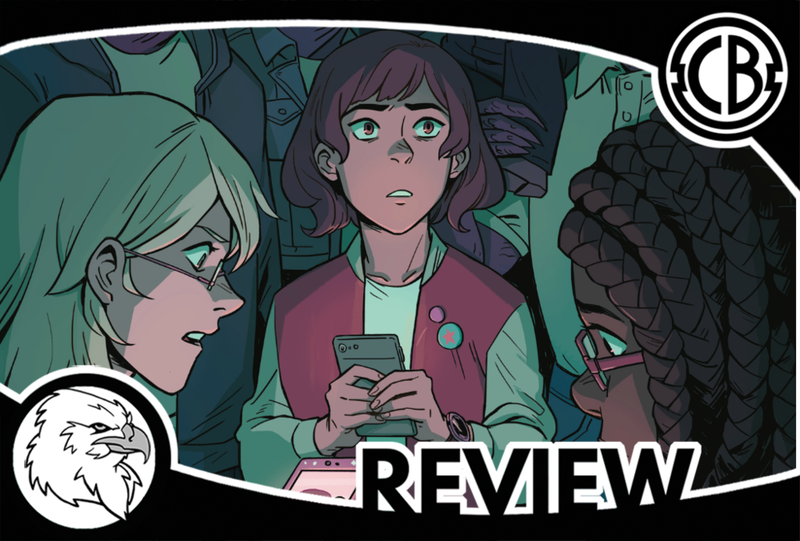 The comic centers around three friends and the new friend, nicknamed Flips, appears to fit into the original duo of friends, Mitra and Kyra, pretty easily. It is where this relationship advances that I had a little problem with. Everything appears to be going fine, but the main character, Mitra, is already showing signs of being jealous without any reason to be. It is only until later on where I understood where her jealousy was coming from, but it still felt like unneeded drama and, like I said earlier, I was waiting for the literal goosebumps to occur. It is when Mitra breaks her phone and is mysteriously sent a new one where the comic starts to pick up its pace. The only bad thing about this is the issue is already more than halfway done at this point. Still, the comic does deliver some fun references towards the end. The phone’s camera appears to be a newer version of the camera from Say Cheese and Die!, but instead of randomly foretelling the future this camera allows the user to choose a filter or apply stickers which will have a certain outcome. I have to admit, it was a delight to see Mitra take a photo of school bullies and apply a Curly sticker and a Slappy sticker throwing up which, in turn, made the bullies do the same. Then Mitra uses an app on the phone which turns out to be a game referencing the story Calling all Creeps. Lastly, we see, the main threat of the comic, Slappy. The dummy Slappy has been the face of Goosebumps as of late and I have no problem with him playing a huge part in the comic; I just hope I don’t get Slappy fatigue as he played a major role in the last comic: Goosebumps Monsters at Midnight. In regards to the art, it does fit the general tone of the comic and each character has a unique style and look which makes them stand out amongst each other. Also, the portrayal of the school to the character’s households are authentic while the colors have a nice vibrant look which helped when the story felt a little slow.